There are 3 users watching this listing. In the hands of muff1. Use TB2QA7P to reference this item. This coin is meant to travel and spread awareness about the fact that we should always be careful on the road and pay special attention to motorcyclists. Being courteous and checking carefully to all those sharing the road with us should be a priority. Whoever we are, we all want to get home to our families safe and sound. Look left, look right, look bike............................................. Ce géocoin a comme but de voyager et d'attirer l'attention sur le fait que nous devrions toujours être prudents sur la route et être vigileants envers les motocyclistes devrait être une priorité. Soyez courtois et faites attention à ceux qui partagent la route avec vous. Qui que nous soyons, nous voulons tous retourner à la maison sains et saufs. Regardez à gauche et à droite. Pensez bicycle! 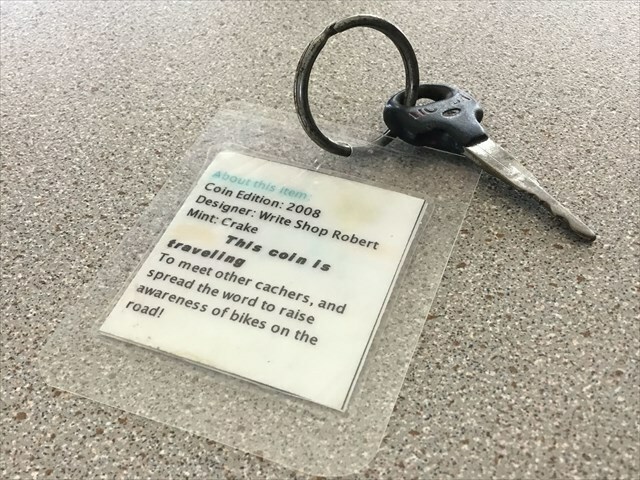 As of October 2018, this missing wooden token has been replaced by an old Honda motorbike key. Thanks to Harrowand for giving our traveler a new life.